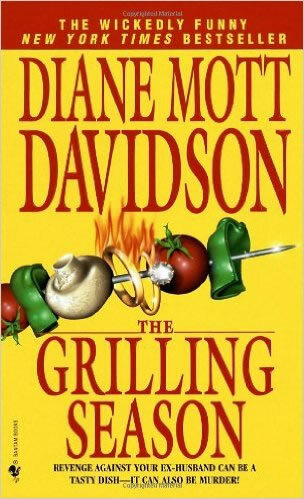 For fans of Diane Mott Davidson's unique blend of sumptuous fare and first-class suspense, The Grilling Season, her seventh in the cordon bleu series, is truly a mystery to savor. Hired to cater a hockey party, Goldy comes up with a winning menu featuring zesty South of the Border Appetizers, succulent Goalies' Grilled Tuna and iced Stanley Cupcakes. Yet Patricia McCracken, her client and long-suffering friend, won't be satisfied until Goldy adds a hefty side order of revenge. . .
Patricia is convinced obstetrician and her Health Maintenance Organization--penny-pinching ACHMO--are to blame for the recent loss of her baby.And the doctor in question is none other that John Richard Korman, Aspen Meadow's leading ob/gyn and Goldy's ex-husband, whose clean-cut good looks hide his dirty habit of battering women.Now, Patricia is suing the doctor and ACHMO for malpractice, but that's not enough.She wants Goldy's advice on getting even--and coming out on top. At first, Goldy relishes the fact that her ex-husband is finally going to pay.Even so, it's a horrid shock when John Richard is arrested for the murder of his current girlfriend, glamorous Suz Craig. . .especially when it's Goldy who makes the gruesome discovery. Shaken by the thought that she could easily have been the victim, Goldy feverishly throws herself into her work.But with her new husband, homicide cop Tom Schulz, delegated to the background of the case, and her fourteen-year-old son begging to prove his father innocent, Goldy has no choice but to sift through Aspen Meadow's premium mix of sizzling gossip and reheated rumor for clues. Will Goldy's fresh-baked Chocolate Comfort Cookies give her the strength to disentangle a baffling mystery that threatens her catering deadline, her relationship with her son, and even her lifeâ€”The Grilling Season, replete with tantalizing recipes, is Diane Mott Davidson's tastiest mystery yet.